We have a climate thread, so why not a weather thread for unusual or interesting weather events. Like the current situation in the North Atlantic. A really, really huge low is currently dominating the weather in the entire North Atlantic and all of Europe. Below is the situation at 13UTC today, a low pressure centred north of Scotland at 926 hPa. 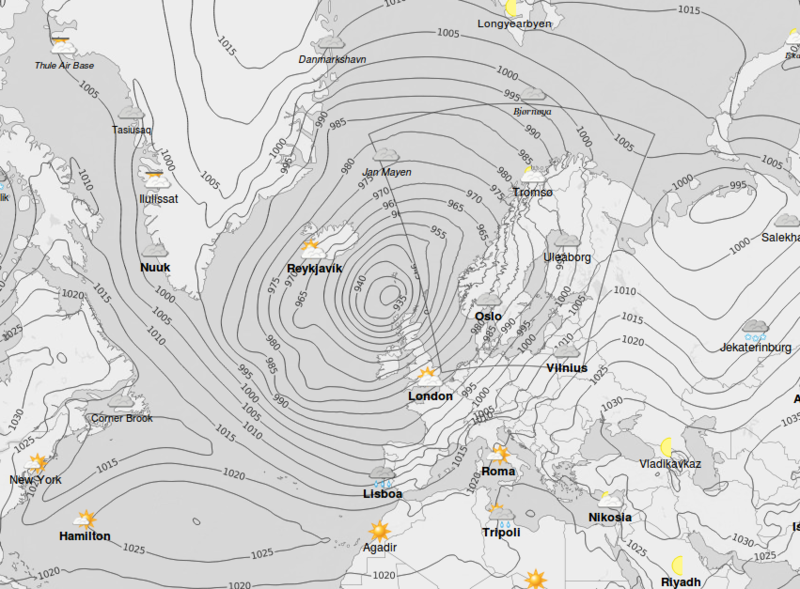 The deepest low ever recorded in the North Atlantic had 916 hPa. So the current situation is quite close to that. The storm is currently disrupting travel across the UK and Scandinavia. It got to force 8 here, which was quite nice but less than I'd hoped. There was a storm here two months ago that reached force 10 here on the mainland and 12 on the island Vlieland. That was quite a sight to behold. We have a climate thread, so why not a weather thread for unusual or interesting weather events. 926mb is a very impressive low; that's the same kind of pressure typically seen in a category 4 hurricane. The wind isn't as strong as that would suggest, as the extratropical cyclones tend to have a smaller pressure gradient, but that also means the effects cover a much larger area. The system reminds me of the latter stages of Hurricane Sandy where the peak wind was a couple levels below what the pressure would indicate for a hurricane, but the storm surge and areal extent were extreme. The windfield extended from Cuba all the way to the Great Lakes and into Canada. How's the system affecting you in Norway, midtskogen? I saw Oslo is getting a lot of rain out of it. 926mb is a very impressive low; that's the same kind of pressure typically seen in a category 4 hurricane. The wind isn't as strong as that would suggest, as the extratropical cyclones tend to have a smaller pressure gradient, but that also means the effects cover a much larger area. Yes, this is not a very windy system, but it affects an extremely large area. Exposed areas in all of Norway's length from 58 to 71N are getting high winds today (> 20 m/s). Enough to shut down some ferry services and closing the mountain passes between connecting the different parts of Norway, but that happens several times every winter. 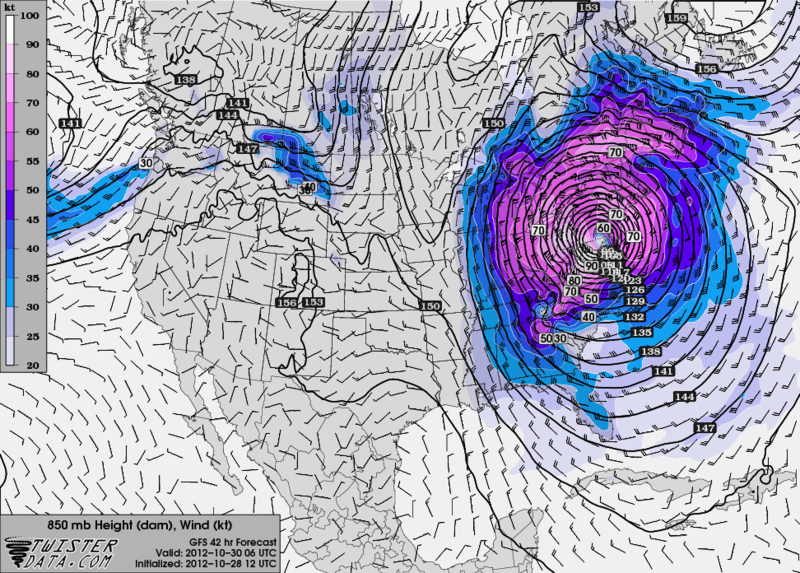 There is something else called a polar low, a kind of Arctic equivalent of tropical cyclones. They sometimes hit the coast in northern Norway in winter and can get very violent. They're very small compared to their tropical sisters and form and disappear quickly and are very hard to predict. Often the warnings are only hours ahead. 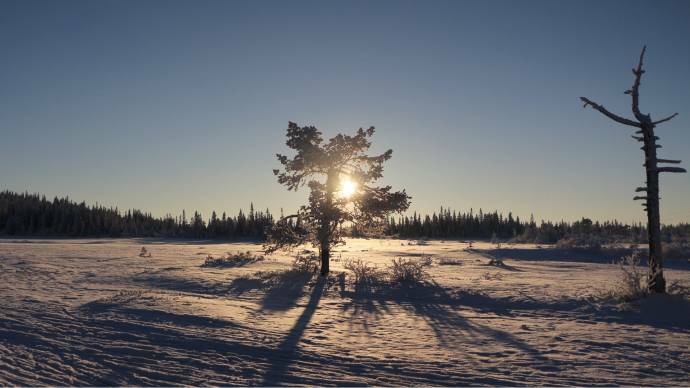 Here's an example of what they bring out of the blue from the previous winter: Været som var (a programme aired yesterday recapping the year weather wise). As I'm typing this it's quite windy outside (for Oslo) from the south, +3 °C, and hail is hammering at the walls and windows. My lightning sensor is even reporting strong activity in the vicinity. Very unusual here in winter. More like western coast weather. The pressure turned at 974 hPa (another more windy storm earlier this month bottomed here at 961). We had 5 cm of wet snow this morning, which technically saved the white Christmas (snow is officially observed at 7am), but it was washed away by rain before the evening. I checked the statistics for another place in Oslo at roughly the same elevation going back to 1896 except 1937-1953, and in those 100 years 6 were without snow on Christmas eve: 1900, 1924, 1932, 1957, 1972 and 2000. In downtown Oslo roughly 1 in 3 Christmases lacks snow, though. Just a nice visualization of global weather conditions, updated every three hours, don't forget to play with the settings. That is quite an awesome visualization. Well that just got saved to my favorites. Thanks, Solaris! The power was either completely gone or partly in the sense that one phase was gone, it seems. And lucky that I recently modded the UPS attaching 3 car batteries to it to increase capacity, so my weather station and computers down there were operational all the time, though the capacity was down to 16% before the power was properly restored. Well here iN Sweden it snowed for 2 days and no more in december. We celebrated christmas with no snow outside ;( Felt really weird since it almost always snow at christmas. Finally an end to a very long stretch of abnormal weather here in Scandinavia. In fact, the recent deep low in the US manage to push weather so high that it disturbed the jet streams that have locked the recent weather patterns of stormy weather. Today was the first (virtually) cloudless day around Oslo for four weeks. It's crazy here i live, in Bodø. No precipitation at all. I miss the snow. We don't have snow at all here. There is coming some precipitation on Monday, but it will be rain and warmer weather. Very unusual. The jet stream have indeed caused the weather to lock, but it has caused that we don't get any precipitation, and this has lasted the whole January. 91% cloud cover is what I've measured for January for Oslo. And then I'm generous - in practice there was only one single properly clear night, not i.e. just random cracks in the cloud cover useful for nothing. While I don't mind snow, I also would like to see some clear sky occasionally as well. There were 8 hours of sunshine in all of January. Today it has been snowing for 21 days in a row, and there's no hint of a break in the 10 day forecast. So if you wonder where the snow went, it's down here. After 34 days in a row with snowfall there was no snowfall today, only rain (not really an improvement...), so the streak is broken. So far this year we've had less than 11 hours of accumulated sunshine. Further north, in Longyearbyen at 78N, halfway through February the mean temperature for the month has been -0.1C which is 16.1 degrees above the normal. Today is also the end of the polar night up there. Spring is starting here already after a winter with temperatures that rarely got below 8 degrees... Flowers are popping up, trees are colouring pink, and some fruits have even started to grow. Last year, this stuff didn't start until late March.